How should we view the American custom of celebrating Thanksgiving Day? The Thanksgiving holiday was established in comparatively recent years. It is, of course, not mentioned in Scripture — but the principle of attending and celebrating national holidays is made clear in scripture. Thanksgiving Day was established by the early colonists, not by any divine authority. But this in itself does not make it wrong to celebrate with good fellowship. Notice the example of Jesus Christ. In John 10:22 we find that Christ attended the "Feast of Dedication," which was established by the Jews years before to commemorate the purification of the temple at Jerusalem. That day was celebrated on the anniversary of the day that the reestablishment of Divine workship occurred after Antiochus Epiphanes had been vanquished and the Temple purified about 165 B.C. Jesus' attendance at that annual holiday clearly illustrated that it is not wrong to attend or celebrate a national holiday established for an honorable purpose. There was nothing wrong in the Jew's celebrating the dedication of the temple and giving God special gratitude on that day. God led Esther and Mordecai to establish the Feast of Purin in commemoration of the miraculous deliverance of the Jews from bloody Haman (see the last chapter of Esther). The national holidays celebrated by the Jews has, of course, no special significance for the non-Jew — just as Thanksgiving Day holds no special significance for our non-American brethren scattered around the world. God permits these customs only if they do not get out of hand. WHAT GOD EXPRESSLY FORBIDS IS THE OBSERVANCE OF PAGAN FESTIVALS WHICH WERE INVENTED AS DELIBERATE SUBSTITUTES FOR THE PLAN AND PROGRAM OF GOD. We are not to adopt in God's worship those customs which the heathen used in serving their gods. But it is proper and fitting for national leaders to set aside time for the whole nation to give God special thanks for his unique bounty to this nation. Thanksgiving Day was first celebrated by the Pilgrims in 1621 after their first harvest had been entirely reaped. On that day they paid tribute to God for all their bountiful and undeserved material and spiritual blessings. Thanksgiving Day gradually became neglected and was revived during the Civil War as a day of special national thanksgiving for preserving this nation. This American thanksgiving day does NOT have a pagan origin despite the claims of certain fringe sects. It is not usually celebrated with pagan ceremonial customs in honor of pagan traditions and gods, as are Christmas, Easter and Hallowe'en. If this national holiday becomes corrupted, then it would be high time to reject it — but it generally is not so celebrated today. 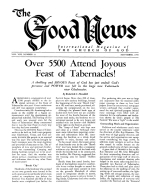 This day of national thanksgiving can be enjoyed by our brethren in America with an especially deep understanding because we know that our personal and national prosperity have come solely as the result of God's promise to Abraham — and as a result of His choice of this nation as the springboard for his Church in this generation. Our brethren in other nations do not celebrate this holiday any more than we celebrate the Jews' feasts of Dedication and Purim. What we all do celebrate are those divinely appointed Holy Days and Festivals established by God in His Word for all men. We NEVER regard a national holiday with the same respect, awe and reverence as we do God's Sabbath and His Holy Days. National HOLIDAYS are just that — holidays, not Holy Days. They are a time of secular pleasure and gratitude, nothing more. But in the midst of the Thanksgiving season, let's not neglect Paul's command in Ephesians 5:20 to "give thanks always." Let's not make a mockery of God's special blessings to this nation.